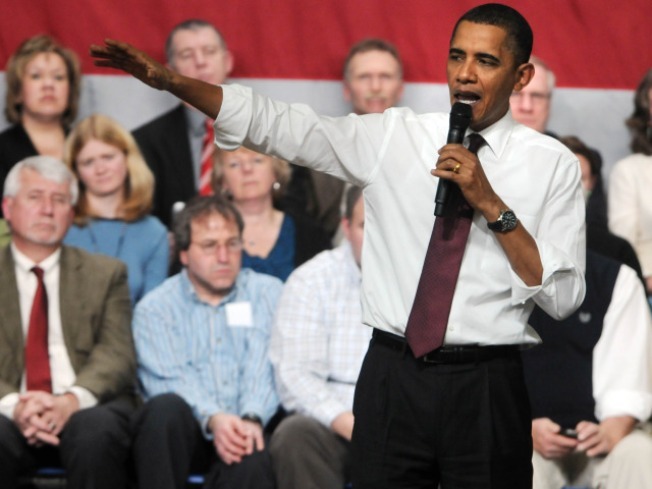 President Barack Obama discusses the job and economy during a town hall meeting February 2, 2010 at Nashua North High School in Nashua, N.H.
James Carville, the “ragin’ Cajun,” said it years ago: Washington’s like a casino. And you never bet against the House (and that’s a house with a big, big letter H). In his first year as president, Barack Obama did and, at least for the moment, it shows. As the February winds blow cold, the president and his team don’t have a lot of warm, post-holiday cheer to pass around. Health care is dead (for now); unemployment is up (for now and the next year or so); and the president’s poll numbers, even before the Massachusetts meltdown, are down. But the number that is the most striking is this: A man who pledged unity and comity on a planet called Washington has now earned the title of being the most polarizing president after his first year in office. The gap between the Democrats and the Republicans who support him is 65 points. Of all our presidents, only George W. Bush had a higher spread — 83 points twice in his eight years. Like young athletes who are in good physical condition, presidents have tremendous recuperative power. But you have to wonder, given where the trend lines seem to be heading and the underlying condition of the patient, how this is going to happen. There are a number of structural problems that now define Obama’s world that are likely to constrain a quick or easy recovery. First, the deficit. The real challenge for the president and his agenda — and it’s both political and financial — is the fundamental contradiction between his short-range goals (deficit reduction and stimulating the economy) and his broader agenda to “remake America.” It would be one thing if Obama hadn’t inherited the most severe recession since the Depression, but the patient was already ill before the president arrived, and it’s going to take longer to recover. The percentage of the deficit against gross domestic product is higher now than at any time in American history other than during World Wars I and II. Even if you bought the argument that reforms of energy, education and health care (the Obama “iron triangle” of change) are essential to long-term efficiency, productivity and growth, how do you make the case, politically, in this environment? Second, the political climate. It may well be that last week’s nationally televised encounter between Obama and House Republicans was both unprecedented and smart, particularly on the president’s part. But how do you get anything done across the aisle if the basic software that motivates the administration and the opposition hasn’t really changed? A “Yes, we can” president is still squaring off against a “No, you won’t” Republican Party that smells both blood and victory in this year’s midterms. The pragmatic center required for deal making in Washington long ago disappeared. To expect its return in such a highly charged environment simply isn’t realistic. Still, with all his woes and travails, Obama is a popular president with extraordinary talent. He is presiding over a country whose people by and large want him to succeed. Things happen, often quite unexpectedly, that can set the stage for recovery and turnaround. Their situations are hardly similar, but just ask two other beleaguered presidents, Ronald Reagan and Bill Clinton. After all, it’s only the start of Year Two. Don’t count this guy out. And in the end, it may just come down to another Carville line: It’s the economy, stupid. If that gets better and jobs come around, chances are that, in 2012, our president won’t be looking for a new one himself. Aaron David Miller is a public policy scholar at the Woodrow Wilson International Center for Scholars, where he’s writing a new book, “Can America Have Another Great President?” (Bantam Books, 2012).